If using frozen shrimp, thaw and drain. Peel garlic and thinly slice. Roughly chop parsley. Heat olive in a pan over medium heat. Add garlic and sauté for approx. 1 min., taking care not to brown the garlic. Add shrimp and chili flakes to pan. Sauté over medium heat until shrimp are cooked all the through, approx. 3 – 4 min. 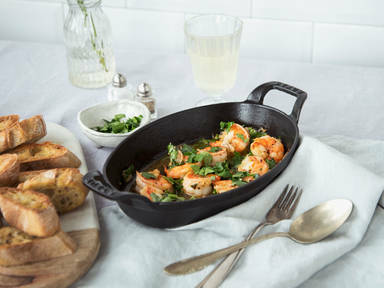 Add white wine to pan with shrimp and cook for approx. 1 – 2 min. more over medium heat. Remove from heat and sprinkle with chopped parsley and salt. Served with toasted baguette slices. Enjoy!